While I am a native of Israel, I have long been connected with the culture and people of Germany. My grandparents came to Israel from Germany, and the household in which I grew up was permeated with German culture, from music to literature. As I developed as a musician, I was particularly influenced by the music of the great German composers, an influence that continues to this day. I struggled to come to terms with the understanding, therefore, that this society — that for which I held such a great affinity and connection — was the same society that gave birth to Nazism, and attempted to rid the world of all Jews. This tension nagged at me from an early age: how could the culture that brought about and championed the work of Bach and Beethoven, Goethe and Nietzsche, be the same one that brought to life the ideology that resulted in the Holocaust? As I started working with the librettists, and learning more about the story of Wahnfried, it became increasingly personal, and I saw the process as an opportunity to learn more about origins of Nazism. Delving deeper into the life of Houston Stewart Chamberlain and his family, I felt compelled to write this opera in order to explore this important part of history and also to say something about it. To preserve it through music, not only for myself but also for others, so that the story is not forgotten. As the main character of the opera, Houston Chamberlain is, in many ways, a contradiction himself. He begins as a failed scientist and a foreigner and is scorned by the public. The libretto allows us a window into his psychology; weak and even pathetic at times, Houston earns our pity, despite his harsh and unfeeling manner. The unfeeling becomes the inhumane as he develops his theories — and the crowds follow his lead. The opera grotesquely celebrates his life, depicting the huge following he created at the time while clearly focusing on his vile and racist thoughts and rhetoric. Nevertheless, Houston's commitment to these ideas does not go unquestioned, as the demons of Levi and of Wagner himself haunt and torment him. On some level, we believe that perhaps Houston knows that what he is doing is wrong. Houston's hunger for power and influence ultimately overtake any sense of guilt or remorse, and he leads himself to his own downfall. The music of the opera creates a fantastical, at times, absurd depiction of Houston and of the Wagner household. Unlike the works of Wagner, in which the long-form, uninterrupted Gesamkunstwerk allows and encourages the audience to be swept away into another reality, I wrote each scene in Wahnfried with a clear ending. The audience has a brief moment to break from the grotesque action of the stage and consider how it might relate to the world more broadly. 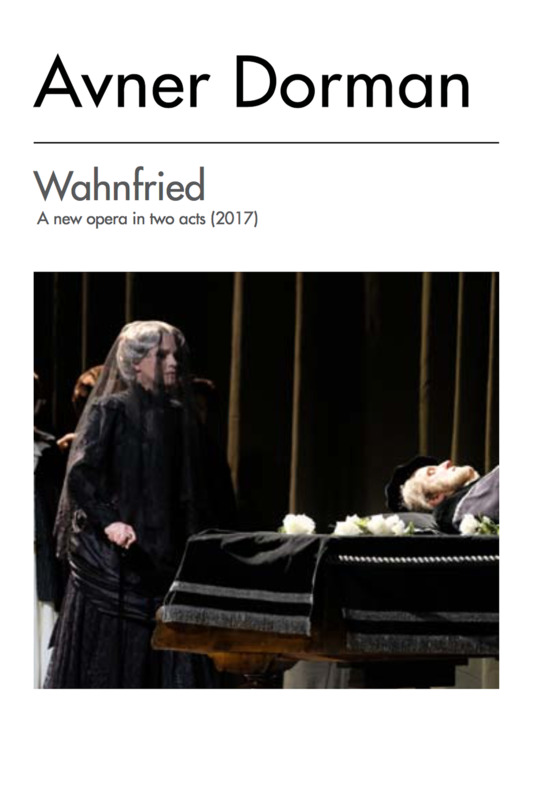 In my experience, the only way for me to deal with the gravity of the Holocaust has been through the use of humor — and the libretto of Wahnfried contains that same dark humor. The music allows the audience to laugh at the events onstage, as the portrayals foray into the ridiculous. Still, much of the music contains marches or march elements, providing a nervous, militaristic undertone despite the wild and unbelievable events occurring on stage. Ultimately, the real-life events that these scenes foreshadow are dark and deeply serious. Having worked with this story and with these characters for several years, it is quite clear to me that the story of Wahnfried is not simply the story of the birth of Nazism. The spread of hatred, intolerance, and fear that we see in Wahnfried and the ideas that Houston Chamberlain wrote over a hundred years ago are still the same elements of the dark and hateful plague we see all around the world today. I see this opera as a cautionary tale that illustrates the power and contagion of hate, no matter the century or the circumstances. I hope that we can learn from the events of Wahnfried and from other darker parts of history and work to build a more peaceful world for the future. Houston Stewart Chamberlain is a failed entomologist, a Darwin enthusiast that cannot bring himself to kill a single bug. Unable to come up with his own grand theory, Chamberlain is looking for a different cause, a calling that would give meaning to his life. He finds his calling in the music of Richard Wagner, and in German nationalism. Wagner's widow, Cosima, enlists Chamberlain to lead the effort to immortalize Wagner's music and link it forever with German nationalism. Chamberlain leaves his first wife and marries Wagner's daughter Eva. He proceeds to write his magnum opus The Foundations of the Nineteenth Century, a book that becomes a seminal work in German nationalism. It is the first major work that advocates Aryan supremacy and promotes fighting Jewish influence. Seeing this opera half way through a Ring Cycle in Wiesbaden, was like tasting an astringent sorbet between the courses of a heavily sauced Wagnerian banquet. A timely antidote to immersion in the Wagner ethos and warning of the ever present threats of populism, hatred and intolerance. Avner Dorman's music-dramatic talent is striking throughout. Surprisingly it seems to have its own language, although it moves rhythmically, tonally, and melodically between the idioms of the last 100 years. One might think of Weill, whose striking force is of course rarely reached or aimed for. Rather Dorman seems to refer to the laconic and cool slyle of Boris Blacher or Gottfried von Einem from the middle of the last century, which preserved classicistic traces. Dorman appears to be a particularly convincing eclecticist, seemingly bringing the controversial origins of his music into a coherent "uniform" - perhaps the crucial quality leap, ranging from simply recording the musical zeitgeist to a masterpiece. Justin Brown, director of the Badische Staatskapelle with an affinity for Wagner, conducted Wahnfried as a masterpiece with dedication, burning intensity, and perfection in sound which was achieved by the impeccably disposed Staatskapelle and the choir. Avner Dorman (…) has put on a loose mix of styles, in which Wagner's quotations, operatic pieces and musical verve penetrate each other. There are "beautiful" arias, sweeping choirs, nostalgically noble string writing, and thundering drum rattles and brass opulence. Sentimentality hardly has a place here, but the rather rattling motoric movement recalls early Sergej Prokofiev or Dmitry Shostakovich. And everything is served perfectly and effectively. Style dogmatologists may turn up their noses but within the framework of this satirical concept, the whole thing works perfectly. With Lutz Hübner and Sarah Nemitz, the most frequently performed German contemporary theatre authors have written a libretto, which in the best sense masters a balancing act. (…) Although Nemitz’s and Hübner's language has a gritty sense of humor, the librettists bring the political dimension of opera brilliantly to the point. They tear the audience into the wake of a cultural history, which is still silenced to this day. Lutz Hübner and Sarah Nemitz wrote a libretto which (…) stands on its own. It is rich in quotations and allusions, a sharp-pointedly over-satire, which critically captures the Wagner circle and shows in individual scenes a profile of Houston Stewart Chamberlain on his way to the inner circle up to his exclusion. Avner Dorman composed music that emerges where contempt and reverence collide. Again and again, quotations from Wagner's operas are flashing, which at the moment they sound are pursued in a grotesque and sarcastical way in order to unmask the Wagner heirs in their wretchedness. For this, Dorman uses any means. In the broadly defined field of the neo-modernism everything sounds somewhere between art and circus music, with children's whistles and percussion-variety, sometimes viciously funny, cinematically exciting or down-to-earth. The singing is semi-arioso, half-speaking, always harmonically oriented. (…) Needle-tip sound colours from the orchestra show the complexity of the score once more. Painfully disturbing, Dorman thereby enhances the perception of the scenery. There is nothing accommodating, conciliatory or melodious at all. (…) Conductor Justin Brown conducts sovereignly and with all the overview that this complex score requires, and also stringently, so that the dramaturgy never lose its effect in any moment. Undoubtedly there is an expert on the desk. Dorman loves loudness and pushing the limits of the orchestra. The vocal lines are catchy, but not banal, chorus and instrumentalists often act just on the border of overload. When Chamberlain praises the alleged advantages of the Aryan race, it sounds like a dance number from a gloomy operetta - great! Justin Brown takes care of precision, dynamism, power at the podium of the Badische Staatskapelle. The audience cheered. Wahnfried brims over with word-wit, allusions and whimsical figures. (…) Dorman, who lives in the USA, writes music that sparkles with ideas. His Israeli parents' house was permeated with German music and literature. He happily loots music history. The "Circus of the Gladiators" and the mourning march from Wagner's "Götterdämmerung" are heard. Most quotations, however, are hidden and alienated with quirky harmonies. Dorman is mainly influenced by jazz, minimal music and baroque music. His music develops an irresistible pull. The highly engaged Justin Brown with his brilliantly performing Badische Staatskapelle ensured the perfect realization of the virtuosic score.